In the process of completing thousands of migration projects,Mobilize.Net has developed a mature migration methodology that results in a predictable, controlled, and cost-effective migration process. The project formulation and analysis process, called a Ready Assessment, provides a detailed project plan with an accurate budget and schedule. The assessment reflects both the project’s requirements and all the experience that Mobilize.Net has gathered in thousands of migration projects throughout the years. It is important to have the right team to perform a successful migration. The Migration Methodology defines roles and responsibilities for the team. There are some significant differences between a traditional software development project and a migration. 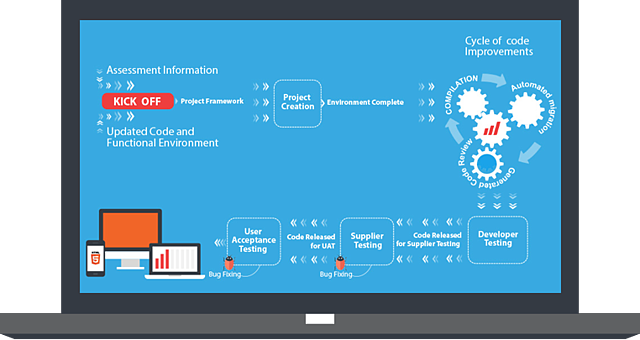 The Migration Methodology's project life cycle addresses the differences to ensure flawless execution and results. The Migration Methodology outlines Quality Assurance activities and milestones to guarantee the project meets or exceeds the expectations of customers. In addition, Mobilize.Net uses an automated Migration Project Tracking System to manage all migration projects. The Visual Basic Upgrade Companion is key to the high productivity of migration projects, which can save as much as 80% of the cost of a rewrite. It is executed at this stage. Mobilize migration services dramatically reduce the time and cost of migrating legacy applications to .NET, web, mobile, and cloud. 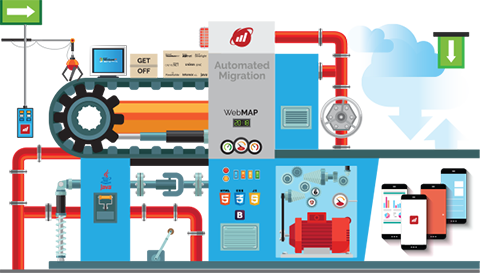 Our services provide automation technology, services and support to ensure that your migration is on schedule, on budget, at quality. Learn how you can migrate your legacy apps to .NET, web, mobile and cloud for a fraction of the cost of rewriting them.